CTAn (CT-Analyser) is a software package for Bruker X-ray micro-CT and nano-CT, for analysis and visualisation by surface rendering. Datasets can be analysed and processed in 2D or 3D for morphometry and densitometry. Bruker is constantly working on new developments for their software and providing extra features for their users. Here’s a round-up of new tools and capabilities in the latest version CTAn v.1.18. Blue Scientific is the official distributor for Bruker Micro-CT in the UK and Nordic region (Norway, Sweden, Iceland, Finland, Denmark). For more information or quotes, please get in touch. The filtering plug-in now includes anisotropic diffusion. Anisotropic means not oriented uniformly. Smoothing is only applied perpendicular to local edges, so the edges are not blurred. “Diffusion” means that there is no general increase or decrease in intensity. Intensity signals are not amplified or reduced, which is important for accuracy when measuring density. Anisotropic diffusion balances noise reduction and edge preservation. Smoothing is not applied in areas where there is a significant change in grey values. 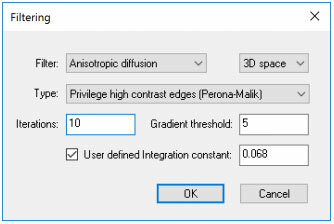 In the morphological operations plug-in, a tolerance can now be defined for watershed separation. Regional minima is suppressed by the H-minima transform, with a dynamic intensity equal to or less than the tolerance value. In the individual object analysis plug-in, colour-coded images can be saved to the clipboard. A grey value is assigned to each individual object according to your settings – which now also includes object labels. Grey values can be assigned randomly to individual objects. Example of object labelling. Separate objects have different grey values, so you can evaluate the results of watershedding more easily. Colour coding also makes 3D renders easier to intepret. Previously, Euler number and connectivity parameters were only available for general 3D analysis. 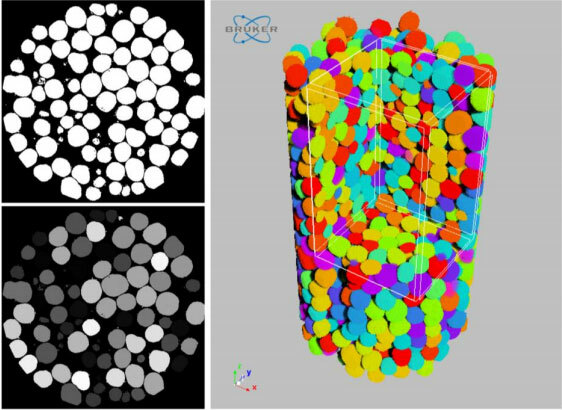 They are now also available for analysing individual 3D objects. The algorithm for calculating Euler numbers has been updated for better performance with negative connectivity. There is a new plug-in for local orientation analysis, which calculates greyscale gradients within a specified radius. This can be in either 2D or 3D. Local orientation analysis in 3D. 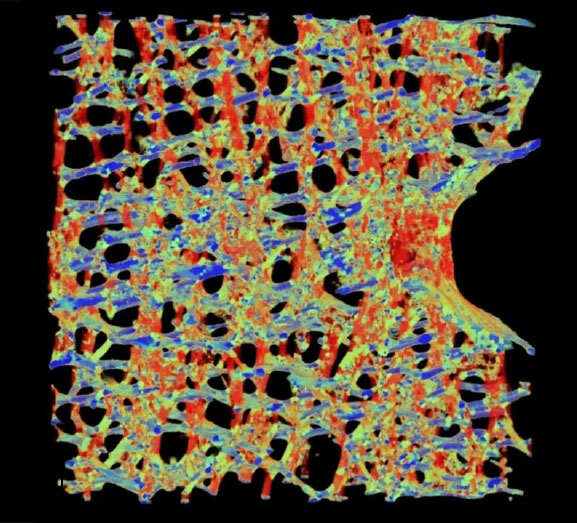 Carbon fibre reinforced polymer (CFRP) scanned at 350nm with Bruker SkyScan nanoCT. Example of local orientation mapping. Red = vertically aligned structures. Blue = horizontal. Green = nodal and oblique structures. CTAn now includes a new seed-growing tool for selecting regions of interest. The region of interest (VOI) can be grown from a “seed” within a binarised region. The VOI expands from an internal point, rather than shrinking from the exterior. 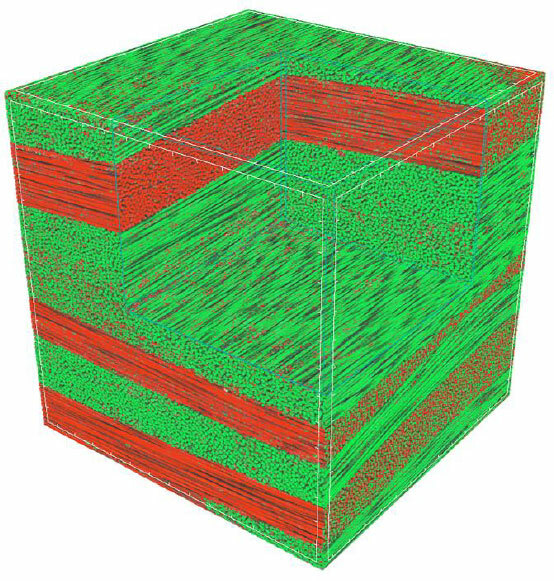 This is valuable in applications where segmentation of certain material types is necessary, without including areas of similar density. This is called fill-out mode, in the ROI-shrink-wrap plug-in. Collect all data first, then analyse automatically in BatMan. Start BatMan automatically after each reconstruction (new feature). This is particularly useful when combined with a push-button micro-CT, and when using a sample changer with the Bruker SkyScan 1275. Scanning, reconstruction and analysis can then be carried out automatically without any user intervention. This new feature is compatible with all SkyScan systems, for use with relevant applications. Otherwise please contact us – Blue Scientific is the official UK and Nordic distributor for Bruker Micro-CT and we’re available to answer all your questions and provide quotes for any systems in the range.